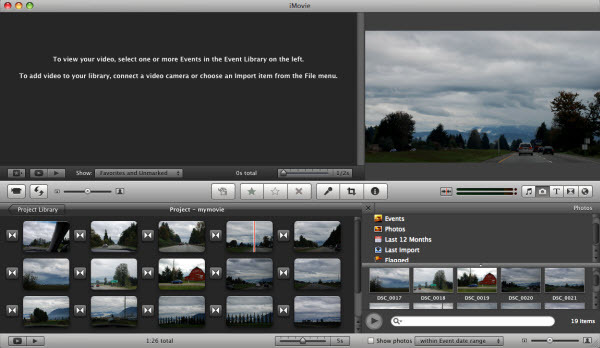 The Apple iMovie lets you create slide show movies on Mac OS X with photos, video clips, and music with ease. You can add titles, apply transitions, set effects with basic color correction and video enhancement tools, etc. With iMovie, you can import photo and video files from your Mac hard drive. You can also import video footage to the Mac using either the FireWire interface on most MiniDV format digital video cameras or the computer's USB port. In this guide, let me show how you can easily create photo slideshow on Mac using iMovie. 2. In the new project, switch to the "Photos" tab. 3. In the "Photos" area, drag and drop photos from iPhoto to the left panel of the project. 4. After all necessary settings such as music and sound effects, titles, transitions, cropping, etc, click "Share" -> "Export Movie..." to start creating photo slideshow movie on Mac. The iMovie cannot burn the slideshow to DVD discs. 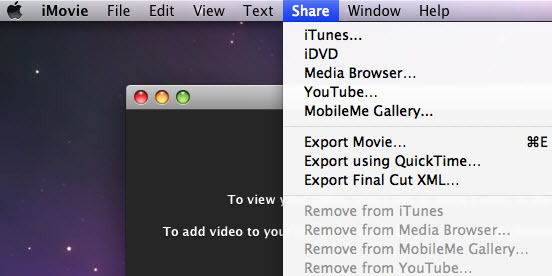 If you'd like to burn photo slideshow to DVD on Mac, you may download DVD Photo Slideshow for Mac to help you. Learn how to burn photo slideshow to DVD on Mac with DVD Photo Slideshow for Mac.